about his upcoming appearance at SOUTHERN KNIGHTS ATLANTA. 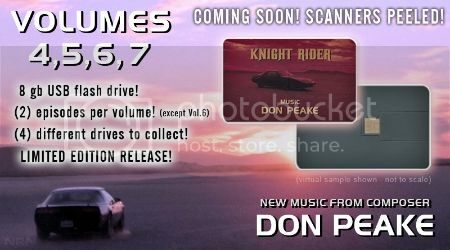 release of the next four volumes of KNIGHT RIDER soundtrack music. sold at the Atlanta convention! This will be Exclusive to your event until later this year. them for $25.00 each because it costs so much to produce them and pay NBCU. Each volume has 2 episodes of music, except volume 6. This is 24 bit audio resolution. This has been an uphill battle for 2 years. these limited edition, collectible, KR soundtracks. Only 250 of each were produced. Don't miss out. They will sell out fast! I wonder when the CD's are coming. Since Perserverance Records is distributing them now (complete gone from Hitchcock-Media Records, including other Peake scores) and Volume 1 and Volume 2 are up there for sale, seems about one a month, I am thinking maybe aroudn the end of the year we'll have most if not all the CD's. There are no CDs. If you read Don's message he said, "NBCU has just given me permission to produce 250 flash drives of Volume 4, V5, V6, and V7". "These will be in a credit card shaped flash drive with USB plug!" "This is 24 bit audio resolution." tharpdevenport wrote: I wonder when the CD's are coming. Since Perserverance Records is distributing them now (complete gone from Hitchcock-Media Records, including other Peake scores) and Volume 1 and Volume 2 are up there for sale, seems about one a month, I am thinking maybe aroudn the end of the year we'll have most if not all the CD's. Yes, but if you read my post, I was asking about when the CD's were coming, which we found out not too long ago, are coming. I read your post, now try mine again. I'm happy for Don but at the same time I'm really disappointed that there will be no physical or even digital release immediately after the event. I've been visiting this boards pretty much every day for the last couple of years waiting for the release info and this is not what I was expecting. I'm willing to pay big bucks for all the new releases but right now it's just impossible for us folks from Europe. Bummer. Well, reading Don's statement, he said, "This will be Exclusive to your event until later this year." That means that he will be selling them at SOUTHERN KNIGHTS ATLANTA first, but will be selling them to others later this year. Now that could mean the week after SOUTHERN KNIGHTS ATLANTA or a few months later. That's up to Don. I was only passing along the information to those that would be attending SOUTHERN KNIGHTS ATLANTA. I was very honored that Don would give the event an exclusive on the release of the newest soundtrack volumes. Maybe you can message Don through his Facebook page and ask him if he has a time set to release the remaining copies that aren't sold at SOUTHERN KNIGHTS ATLANTA. Black Cat wrote: I'm happy for Don but at the same time I'm really disappointed that there will be no physical or even digital release immediately after the event. I've been visiting this boards pretty much every day for the last couple of years waiting for the release info and this is not what I was expecting. I'm willing to pay big bucks for all the new releases but right now it's just impossible for us folks from Europe. Bummer. Exciting news. I've been waiting for these albums for years! Unfortunately, due to family commitments I'm unable to make it to Southern Knights Atlanta. For anyone who's going and who intends to buy Don's latest releases, please post your thoughts once you've had time to listen to them. I'm sure Perseverance will begin selling these albums to the public at some point, though in what format I couldn't say (they've only produced 250 copies of each of these four USB sticks, apparently). Also: the USB stick is a pretty cool distribution idea. It actually makes it possible for us to get even better quality files than a standard Redbook audio CD, which only supports 16 bit depth (Don has already stated that the files on the USB sticks are 24-bit). Hopefully they're unencumbered by lossy compression and are in a format like WAV or FLAC. With 8 GB per stick, there's plenty of room. Mark, if there happens to be any of the limited 250-copy album run left over at the end of the convention this week, any plans to sell or auction the remaining inventory? Failing that, I would be happy to pay anyone attending the con in advance (full amount plus extra for shipping and your trouble) to pick me up a set of four and send them my way. this was an amazing event. Only in Atlanta can you watch KITT vs KARR with 2 main characters giving commentary along with Ron Martinez. Also hear Don Peake play guitar. This show was a huge success. If you missed it you should try to make it next year. I'm definitely going to try to make it in the future. It's difficult to find the time and money while raising a young boy, but he likes Knight Rider and one day he will be old enough to come with me. Don Peake is now offering the new volumes and he's shipping worldwide. Don Peake wrote: OK HERE WE GO! I am now officially offering Volumes 4 thru 7 at $25 per volume, plus postage. Don Peake wrote: Yes...I will be shipping worldwide. I have PayPal account so just go to PayPal and click on send someone money. They do sound Super. And there is 7 gigabytes of extra space on each drive for your other favorite content. Anyone know what the S/H cost is? For those of you who sent payment for the albums directly to Don Peake last month, has anyone heard any updates? I see that Volume 4 is now listed and available for purchase on Perseverance Records' website. Despite sending payment for all four albums to Don and then following up with an email a week or two ago, I haven't heard anything back. I know quantities are limited and I don't want to miss out on this, but I'm not sure where else to turn. Anyone have any info? Chief Oddball wrote: For those of you who sent payment for the albums directly to Don Peake last month, has anyone heard any updates? Was wondering the same thing. The moment Don has announced that he's selling them, I've dropped him an email asking how much would it cost to post it to the UK. Haven't heard back since then, which was disappointing to me, as Don seemed to be very excited about these releases. Thanks for the heads up on the Perseverance Records' website. Just ordered Vol 4. Looks like I'll be paying for the postage four times, but I don't care, I just want them as fast as I can!! I got a Facebook message from Don just a few days ago confirming that I had sent him money and asking for my address so it looks like he is making progress on getting these out to everyone. Glad to see that Perseverance Records is also now selling Vol. 4 of the Flash Drive, hopefully the rest will follow at some point. I'm still a little confused as to why these releases aren't getting put onto CD's and why it's only limited to 250 for each volume. According to Don via a post he made on Southern Knights' Facebook page, he said that CD's don't allow for sufficient audio quality and that's why he's not doing a release on that format but IMO, CD's give fantastic audio quality for most uses. I seriously doubt the vast majority of fans have the sound systems, nor the ear, to distinguish between the 24-bit audio files on these Flash drives versus the 16-bit on CD's anyway so it seems like it's nitpicking a bit. I also keep hoping the tracks will eventually make their way to the iTunes Store as well, since they carry the previous releases already. I've said it before and I'll reiterate it again, but I really wish Don would team up with a company like La-La Land Records, as they do both TV and film score releases and I've yet to see them put out a release of anything that was anything less than amazing from the audio quality to the final packaging. I'm sure it comes down to cost of production and release, but I'm sure some sort of deal could be worked out. He could even do a Kickstarter campaign to raise the funds from fans and I'm sure he'd meet or even exceed his goal. Regardless, I'm still looking forward to getting one of each of the new volumes and I hope there will be more of them in the future. KFCreator, that's good to hear. I also just last night looked up Don's Facebook page and sent him a message through there. When I originally sent him the funds back in August I included an extra $30 to cover the shipping cost since I didn't know what it would be. Seeing Volume 4 out on Persey tempts me to purchase another copy right now, since "Killer K.I.T.T." is the score I've most wanted, but I'll try to hold out for a few more days. Since I'm interested in all four albums, it would definitely be more efficient (and cost effective) to send one shipment instead of four separate ones. Regarding a CD release, personally I'm indifferent as long as we're getting lossless files (which we are -- I believe both uncompressed WAV and traditional MP3 are included on the flash drives). Although I doubt I have the equipment to notice the difference between 16- and 24-bit, it's fairly cheap and easy for just about anyone to burn their own CDs if they would like. What you're really missing out on is the "collectability" of a CD release, and how it would fit nicely in a case next to the other Don Peake and Stu Phillips release I've collected over the years (some of them autographed). But at this point in my life I've gotten to where I feel it's the content that really matters, so as long as the content in this case is lossless, I'm perfectly OK with the chosen media. KFCreator wrote: I also keep hoping the tracks will eventually make their way to the iTunes Store as well, since they carry the previous releases already. I don't think iTunes is carrying Volumes 1 - 3 of Don's Knight Rider soundtracks anymore. Every time I've looked, Stu Phillips's soundtrack is the only one that's there. I was never able to get a response from Don, unfortunately. I went ahead and ordered a second copy of Volume 4 from Perseverance just to make sure I would get one; it should be here Friday according to USPS. If I eventually do hear from Don RE: the original $130 I sent him, and end up getting the copies I originally ordered, I'll sell my spare copies in case other fans want them. Just surprised that there's been so little communication. Just got my copy of Vol. 4, which I ordered from Perseverance Records late last week. Loving it! My copy of Vol. 4 from Perseverance just arrived. It took 5 working days to get it to UK, not bad at all. I'm absolutely loving it, it's like childhood memories remastered I like Don's work on Season 1 the most, so Nice Indecent Little Town is a great treat. Looking forward to Chariot of Gold the most though!! Still haven't received a response from Don. I ordered Volumes 4, 5, 6, and 7 through PayPal, in which Don had mentioned on Facebook to pay him through Paypal and he would contact each individual on the shipping costs. I paid him and did not receive a response. I even called him at the studio and he said he would call me back. Never did. He later Facebook'ed and said that he was in the process of getting everyone contacted. That was about 3 weeks ago. I still have not received anything. I am sure he's swamped, but this is not cool. If I hear anything, I'll let you know, and please let me know too. Stevetaxman, I'm in the same boat as you, so you're not alone. You're right that Don probably is swamped, but for those of us who sent him our money (as much as $100+) through PayPal weeks ago, I agree that the handling of this has been very poor. Had I known that Vol. 4 was going to be available for purchase through the Perseverance website only a couple of weeks after the event, I would have held off and ordered mine like everyone else here. Unfortunately, I don't have the money to spend for another order of Vol. 4, so my frustration level is extremely high too. I don't understand why Don couldn't have directed the PayPal orders over to perseverance to have them fill them and get them out to everyone, it seems like that would have been the logical and efficient way of doing it. My fear is that Perseverance and Don are drawing from the same limited pile of 250 copies of drives and that some of us may never see our orders materialize. I really hope the people who sent money via PayPal have copies already set aside. I'll keep everyone here updated as well if I hear anything further from Don. I know of no one who has gotten their order. I got mine from Perservance, but I am out the money I sent Don on Paypal. What makes me upset is that Don has ignored or appeared to ignore emails and calls. I will keep you posted.